At a time when divorce is becoming less common for younger adults, so-called “gray divorce” is on the rise: Among U.S. adults ages 50 and older, the divorce rate has roughly doubled since the 1990s. In 2015, for every 1,000 married persons ages 50 and older, 10 divorced – up from five in 1990, according to data from the National Center for Health Statistics and U.S. Census Bureau. Among those ages 65 and older, the divorce rate has roughly tripled since 1990, reaching six people per 1,000 married persons in 2015. 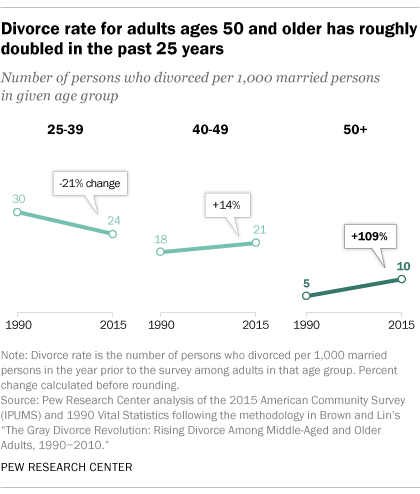 While the divorce rate for adults 50 and older has risen sharply over the past 25 years, it has remained relatively steady for this age group since 2008, when the Census Bureau began collecting divorce data yearly as part of its American Community Survey. Still, the divorce rate for those younger than 50 is about twice as high as it is for adults 50 and older. And since 1990 the divorce rate has also climbed slightly for adults ages 40 to 49, though not to the extent of those 50 and older. In 2015, 21 adults ages 40 to 49 divorced per 1,000 married persons in that age range – up slightly from 18 in 1990. By contrast, the divorce rate for adults ages 25 to 39 has fallen from 30 persons per 1,000 married persons in 1990 to 24 in 2015. This decline is attributed at least in part to younger generations putting off marriage until later ages. The median age at first marriage for men in 2016 was 29.5, and for women it was 27.4 – up from 26.1 and 23.9, respectively, in 1990. In addition, those who do end up marrying are more likely to be college-educated, and research shows that college-educated adults have a lower rate of divorce. During their young adulthood, Baby Boomers had unprecedented levels of divorce. Their marital instability earlier in life is contributing to the rising divorce rate among adults ages 50 and older today, since remarriages tend to be less stable than first marriages. The divorce rate for adults ages 50 and older in remarriages is double the rate of those who have only been married once (16 vs. eight per 1,000 married persons, respectively). Among all adults 50 and older who divorced in 2015, 48% had been in their second or higher marriage. The risk of divorce for adults ages 50 and older is also higher among those who have been married for a shorter time. For example, among adults 50 and older who had been married for less than 10 years, the divorce rate was 21 people per 1,000 married persons in 2015. By contrast, the divorce rate is 13 people per 1,000 married persons for adults ages 50 and older who had been married for 20 to 29 years. This is largely connected to remarriages being less stable than first marriages. 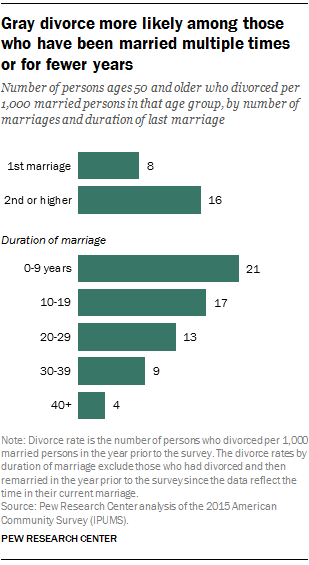 In fact, most adults in this group who have been married less than 20 years were in their second or higher marriage. While the rate of divorce is lower among adults ages 50 and older who have been in longer-term marriages, a significant share of gray divorces do occur among couples who have been married for 30 years or more. Among all adults 50 and older who divorced in the past year, about a third (34%) had been in their prior marriage for at least 30 years, including about one-in-ten (12%) who had been married for 40 years or more. Research indicates that many later-life divorcees have grown unsatisfied with their marriages over the years and are seeking opportunities to pursue their own interests and independence for the remaining years of their lives. But divorce at this stage of life can also have some downsides. Gray divorcees tend to be less financially secure than married and widowed adults, particularly among women. And living alone at older ages can be detrimental to one’s financial comfort and, for men, their satisfaction with their social lives.